Introduction: A pre-emergence and early post-emergence herbicide for control of Watergrass, Barnyardgrass, carb grass, False pimpernel, Foxtail, Goosegrass, Mille, Mexican weed, Morning glory, Pigweed, Spike rush in paddy fields and other situations. H400 (61.48%): Very toxic to aquatic life. H410 (61.48%): Very toxic to aquatic life with long lasting effects. Acute toxicity: 1) Acute oral LD50 for mouse: 560 a.i.mg/kg. 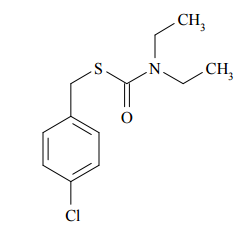 2) Acute dermal LD50 for rat: >5000 a.i.mg/kg. 3) Inhalation LC50 (4 h) for rat: >2.43 a.i.mg/L. 4) Slightly-irritating to skin (rabbits). 5) Slightly-irritating to eyes (rabbits). 6) Not a skin sensitiser (guinea pigs). There was no evidence of carcinogenicity. Thiobencarb is not considered to be a developmental toxicant in rats or rabbits. There were no effects on reproductive parameters. Thiobencarb was shown to lack mutagenicity in three of the four mutagenicity tests conducted. ADI (JMPR): 0.01 mg/kg b.w. Effect on birds: low toxicity to birds, acute oral LD50 for Colinus virginianus is >2000 a.i.mg/kg. Effect on fish: moderate toxicity to fish, acute 96 hour LC50 for Cyprinidae is 0.98 a.i.mg/L. Effect on aquatic invertebrates: moderate toxicity to aquatic invertebrates, acute 48 hour EC50 for Daphnia magna is 1.1 a.i.mg/L. Effect on algae: moderate toxicity to algae, acute 72 hour EC50 for Raphidocelis subcapitata is 0.017 a.i.mg/L. Effect on honeybees: low toxicity to honeybees, contact acute 48 hour LD50 is >100 a.i.��g/bee; oral acute 48 hour LD50 is >100 a.i.��g/bee. Effect on earthworms: moderate toxicity to earthworms, acute 14 day LC50 for Eisenia foetida is 437 a.i.mg/kg. Thiobencarb's production may result in its release to the environment through various waste streams; its use as a herbicide will result in its direct release to the environment. If released to air, a vapor pressure of 2.2��10-5 mm Hg at 25��indicates thiobencarb will exist in both the vapor and particulate phases in the ambient atmosphere. Vapor-phase thiobencarb will be degraded in the atmosphere by reaction with photochemically-produced hydroxyl radicals; the half-life for this reaction in air is estimated to be 15 hours. Particulate-phase thiobencarb will be removed from the atmosphere by wet and dry deposition. Thiobencarb is susceptible to direct photolysis in natural sunlight. If released to soil, thiobencarb is expected to have low-to-slight mobility based upon a range of experimental Koc values from 309-5000. Volatilization from moist or dry soil surfaces is not expected to be an important fate process based upon experimental observations. Only minor loss of thiobencarb occurs from photodegradation on soil surfaces. Biodegradation is the major environmental fate process in soil. The half-life of thiobencarb in soil has been reported to be 2 to 3 weeks in aerobic conditions and 6 to 8 months in anaerobic conditions. Soil half-lives of 21-58 days are also reported based on field studies; a half-life of 3.5 days was observed in a rice field acclimated to thiobencarb. If released into water, thiobencarb is expected to adsorb to suspended solids and sediment based upon the range of Koc values. Volatilization from water surfaces is not expected to be an important fate process based upon this compound's estimated Henry's Law constant of 2.7��10-7 atm-cu m/mole. Measured BCF values ranging from 66 to 523 suggest the potential for bioconcentration in aquatic organisms is moderate-to-high. Biodegradation is a major environmental fate process for thiobencarb in aquatic ecosystems. Laboratory persistence studies have measured half-lives ranging from 6 to 42 days in water or water-sediment systems. Thiobencarb is susceptible to sensitized photo-oxidation in natural waters exposed to sunlight. Thiobencarb is stable to aqueous hydrolysis in the environment. Occupational exposure to thiobencarb occur through inhalation and dermal contact at areas where thiobencarb is used as a herbicide. The general population may be exposed to thiobencarb through ingestion of foods containing thiobencarb residues. Monitoring data indicate that the general population may also be exposed to thiobencarb via inhalation of ambient air, ingestion of drinking water and dermal contact with this compound. Usage: Thiobencarb was a pre-emergence and early post-emergence herbicide for weed control in paddy fields and other situations. Application: Pre-emergence to early post-emergence control of Echinochloa, Leptochloa and Cyperus spp., and other monocotyledonous and annual broad-leaved weeds in direct-seeded and transplanted rice, at 1.5�C7.5 kg/ha.